This week’s Alternative Monday sees artist Emma Davies recount her early experiences with Fermynwoods, including one student following in the social realist tradition of the Kitchen Sink Painters; shaping her journey from freelance artist to Fermynwoods Education Curator and Fellow of the Royal Society for the Encouragement of Arts, Manufactures and Commerce. One of my first encounters with students from The CE Academy remains particularly memorable. In 2012 I was still a newbie in terms of working with these students. 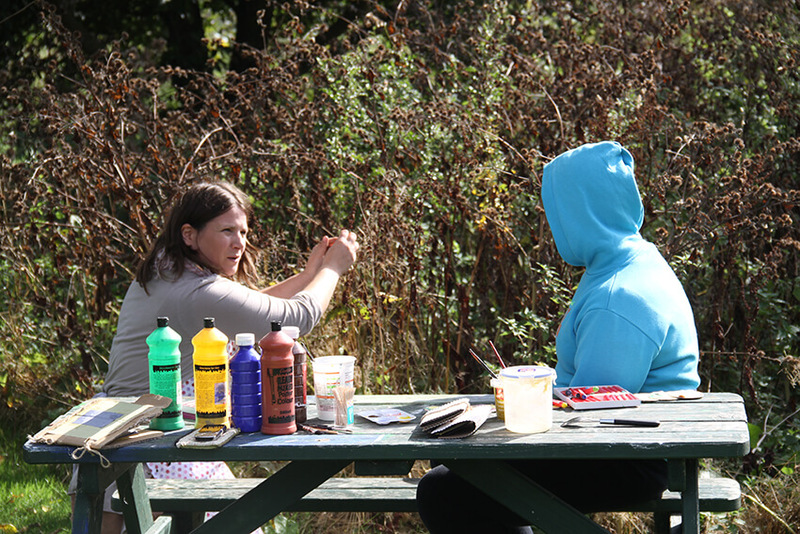 However, I had plenty of experience working with young people mainly in informal settings as a youth worker. Amidst utter loveliness, I was used to bouts of attitude, outpouring of emotions, hyperactivity or non-engagement. My practice at the time focused on painting, drawing and making books. One of my first pitches for a workshop was to ask the students to create observational paintings based on what they saw around them. Either a portrait of the room or a view from the window that looked out across the surrounding landscape, together with a large group plein air painting made up of several panels. David Hockney was a source of inspiration, exploring how he used paint, colour and composition. Also his awareness of the passing of time, especially when painting outside, the changing light and weather informing or impeding the painting process. Materials included poster paint, acrylics, paper and big brushes. The group painting was a success. We huddled in copse and looking up to Sudborough Green Lodge, working as a team to ensure its entirety was captured. Another exercise involved quick fire watercolour sketches. I remember being surrounded by tubes of paint and unwilling students, one of whom declared that I was a “crap artist”. At the end of what seemed like a very long day, I declare that despite my youthwork experience, this comment cut through me. I retreated to the kitchen to wash up some brushes, followed by a hug from Barbara Rawcliffe [a teacher from The CE Academy who was instrumental in founding our 10 year relationship]. This event was revisited a year or two later, as it was used in context of an interview question for the post of Fermynwoods Education Coordinator. I extend my thanks to the student in question, as my answer secured me the job and here I am four and a half years later, now as Education Curator. Throughout this period of intermittent engagement and honest critique, there was one student whose experience of Fermynwoods focused entirely on sleeping in an armchair, eating and conducting regular visits to the toilet. Despite our warm and positive relationship, I had failed to inspire him, and I felt a little defeated. With about half an hour to go before the end of the workshop the sleeping child was not in his chair. “I’m on the toilet”, he called out. He was taking far longer than usual and his usual took rather a long time. After noticing that he had left the door ajar, and establishing all was well, to our surprise and delight he was indeed sitting on the toilet. But with the lid down, drawing board resting on his lap, paints and brushes on the windowsill. He was painting a portrait of his room. A view that he saw regularly; rich in colour, composition, feeling and humour. It’s style somewhere between Hockney and the Kitchen Sink Painters. It was and still is, the best painting that I have ever seen a student produce at Fermynwoods. The latest report of our Toilet Sink Painter is that he is enjoying life as a young farmer. I hope that in some small way, his time spent with us led to this most physical and active choice of careers. Look out for more Alternative Monday posts every fortnight, looking back on some of our favourite alternative provision activities. This entry was posted in Education, News and tagged Alternative Mondays, Alternative Provision, Emma Davies, The CE Academy. Bookmark the permalink.